The quickest, easiest catch basin to install, the Vortex literally acts like one, producing vortex action that moves water even faster than our bullet basins to effectively prevent pooling water and mosquito breeding grounds. A built-in debris collector and anti-tamper feature is incorporated into the design. The pre-formed outlet glues to 4" PVC pipe or fits Mole-Pipe Female adaptor. The Vortex with Atrium grate is perfect for use in flower and/or garden bed areas to capture and divert water run off . 4-in. outlet allows easy connection of Mole-Pipe Female connector or glues to 4-in. PVC pipe. A step up from our traditional box catch basins, these bullet basins are designed with rounded interior surfaces to move water faster and for easy cleaning, plus lock-down feet to prevent movement. They simply snap in place to connect with 3 in. and 4 in. corrugated pipe. Or they can be easily glued to 3 in. and 4 in. PVC. The Storm Drain complete drainage system is easy to install and allows maximum flexibility in solving your drainage requirements around the home or light commercial applications. The systems design allows maximum flexibility in length of channels, corners and intersections. You can connect Storm Drain to Mole-Pipe or 4in. stormwater pipes with bottom or end outlet, Inline collection pit, and prevent leaves or other debris clogging pipes or waterways with the Leaf Guard. 9 X 9 Inch Vortex Catch Basin Pit Complete With Atrium Grate The quickest, easiest catch basin to install, the Vortex literally acts like one, producing vortex action that moves water even faster than our bullet basins to effectively prevent pooling water and mosquito breeding grounds. A built-in debris collector and anti-tamper feature is incorporated into the design. The pre-formed outlet glues to 4" PVC pipe or fits Mole-Pipe Female adaptor. 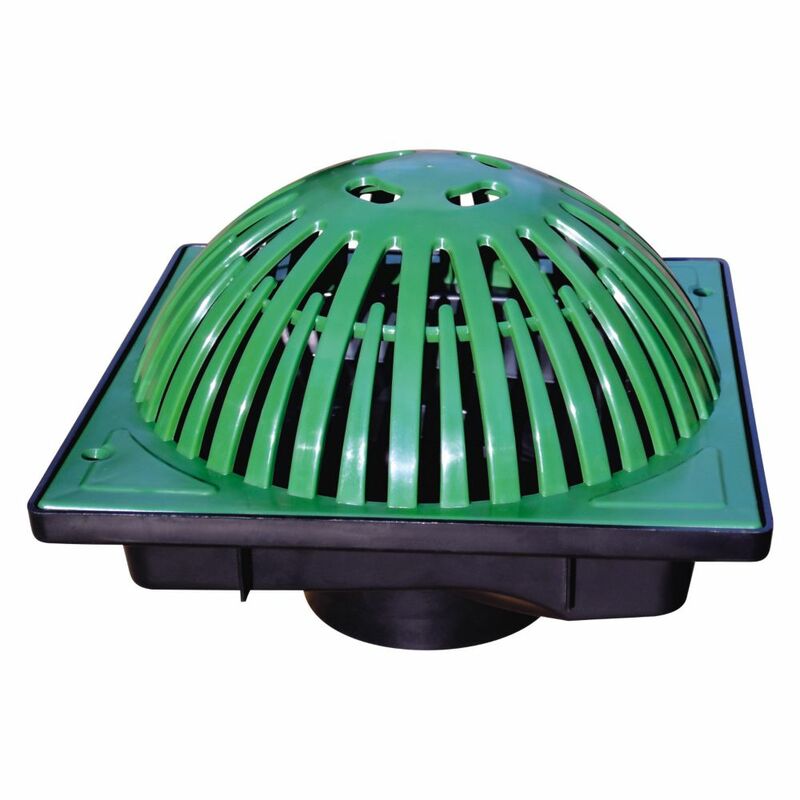 The Vortex with Atrium grate is perfect for use in flower and/or garden bed areas to capture and divert water run off .